Townley girl requires a copy of all participants email addresses. Please know that by entering this giveaway you are giving permission for Townley girl to have that single piece of info. Welcome to the Townley girl Despicable Me 3 Giveaway ! There will be 2 winners each receiving a prize pack worth over $25. arv, Awesome! Must be 18, US only, sorry friends! Winner must return winning e-mail within 48 hours or a new winner will be drawn. Please give the RC a moment to load. While any one entry will enter you, the more tasks you complete, the higher your chances. Good Luck Everyone! Disclosure: Participating bloggers are not responsible for sponsors whom do not send their prize or any injury from said prize(s). Fb, nor any other social networks, are in any way associated with this giveaway. Cool I have some great nieces who would like these. Thanks for the giveaway. 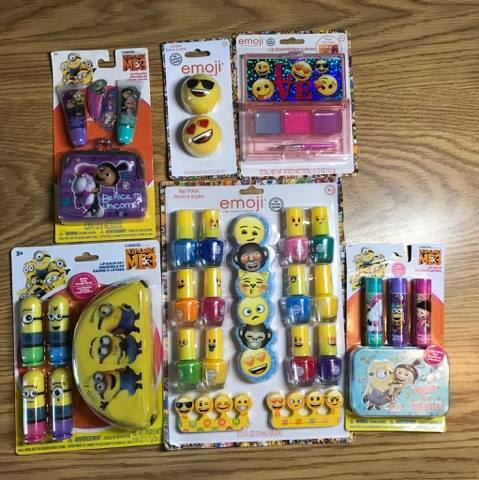 I like the Despicable Me lip balm. I am an email subscriber so that is where I found the giveaway. Thanks for the chance at winning! I found the giveaway on an email from your site. I love Townley girl because they really use cute and modern themes to make stuff that girls love to wear and use. I found out about this giveaway in my email because I follow your blog via email. I like the Townley lip glosses. My great granddaughters would love these items.They love putting their makeup on and fixing their hair with all their accessories!! I found this giveaway on Mom to grandma blog. through email from them. I love the wide variety of characters they have, something for all! I found this through searching on Twitter!